If Zenyatta wins the Breeder’s Cup Classic to cap an undefeated career of 20 straight victories, some say the 6-year-old mare might just be the greatest thoroughbred racehorse in history. Bob Simon reports. Tom Anderson is the producer. Coleman Cowan and Michelle Boniface are the associate producers. Next Saturday she could become the first great American athlete to retire undefeated in more than half a century, since Rocky Marciano stepped down from the ring. 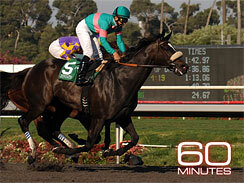 Her name is Zenyatta, she’s six years old and she is a thoroughbred. She has run in 19 races. She has won 19 races. Now she’s going for number 20 at what many believe is the most prestigious competition of the year – the Breeders’ Cup Classic. Some of the best horses from around the world will be running at Churchill Downs and they’re all males, except for Zenyatta. At the age of six, she will also be the oldest horse in the race. The stakes are extremely high, and not just in millions of dollars. Zenyatta is so adored by horse lovers that if she doesn’t beat the boys and win one last time, hearts will be broken everywhere. It would be Babe Ruth striking out in his last at-bat.